Are you wondering how to check the number of visitors for your WordPress site? When you know the number of people visiting your site, reading your content, and buying your products, you can start implementing strategies to GROW those numbers. That’s why we’re going to show you the easiest way to check the number of visitors for your WordPress site in this article. Why Check the Number of Visitors for Your WordPress Site? When you start a business, you invest a certain amount of money, time, and expertise. You also set certain numbers in your mind as your business goals for a targeted time. Numbers are here, there, and everywhere. Numbers actually serve as motivators to business owners. Tracking the number of website visitors is important if you want to grow your total website visitors’ number. By checking how many visitors are currently coming to your site, who they are, and what they do on your site, you can get gain insight and start planning how you should best optimize your site. Website Analytics tools are most commonly used for checking the number of site visitors you receive. You can get data and metrics for your site’s total audience numbers, their topics of interest, demographics, and behaviors on your site using a website analytics tool. Not only that, there are multiple benefits of using website analytics. Using an analytics tool, you can get valuable insights to help grow your business. 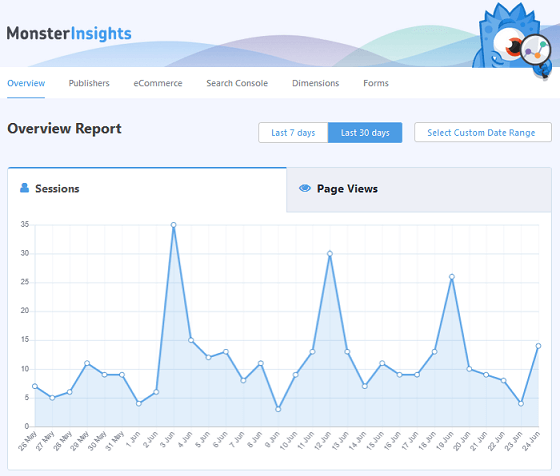 While there are different website analytics tools on the market, MonsterInsights is the most user-friendly tool for beginners. MonsterInsights lets you set up Google Analytics on your WordPress site easily and view your entire website’s analytics in easy-to-understand reports. Now, let’s go ahead and see the steps on how to check the number of visitors to your site. Google Analytics is the most powerful website analytics service available, but it’s a bit complex for beginners. To be able to use it at maximum efficiency, you’ll need to have some coding knowledge or hire an expert to do the job for you. Instead, we’ll use the MonsterInsights plugin to set up Google Analytics on your WordPress site. The plugin simplifies the setup process as well as viewing data. All you need to do to get started is install the plugin on your site. The plugin is available in both free and paid plans, so you’ve got a choice and can use whichever you like. The free version gives you basic features while the paid version provides several advanced tracking options. If you want to use the free plugin, you can directly install it from the official WordPress plugin repository by typing MonsterInsights in the search box. To do so, go to Plugins » Add New in your WordPress dashboard. And then, type MonsterInsights in the search box. After you find the right one, click the Install Now button. Upon installation, don’t forget to activate it. If you’ve purchased MonsterInsights Pro, you’ll need to upload the plugin by going to Plugins » Add New » Upload Plugin in your WordPress dashboard. After you’ve activated the plugin, you’ll need to connect your site with Google Analytics. 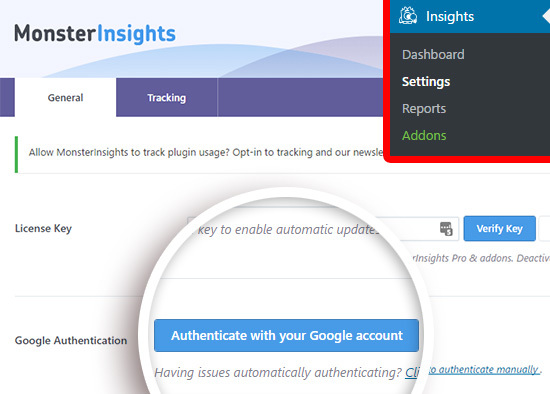 In order to do that, go to Insights » Settings from your WordPress admin panel, and then click the Authenticate with your Google account button. It’ll take a few clicks to complete the authentication process. Once it’s complete, you’re done with the setup process. 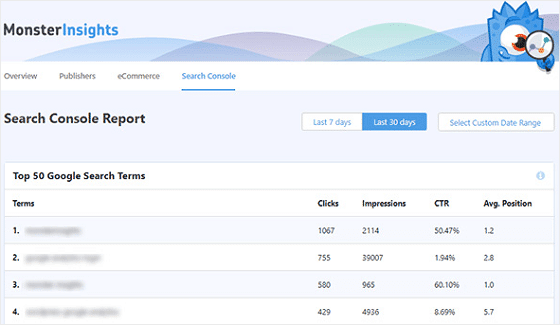 Now that you’ve set up Google Analytics on your site, you can check your website reports. To view the reports, you’ll need to visit Insights » Reports from your admin panel. This will open the Overview Report. Note: Google takes a few hours to gather your site information and data, so you may not find any data immediately after the setup process. The Overview Report includes some of the key metrics that are useful for getting to know your website visitors. The first section (screenshot above) shows a visual graph for the total number of sessions and pageviews your site has gotten in a defined range of time. You can set the time range to 7 days, 30 days, or any days you desire. Just below the graph, you’ll see quick data showing the total number of sessions, pageviews, average session duration, and bounce rate. Then, you’ll see New vs. Returning Visitors and Device Breakdown data in percentages in pie-charts below that. 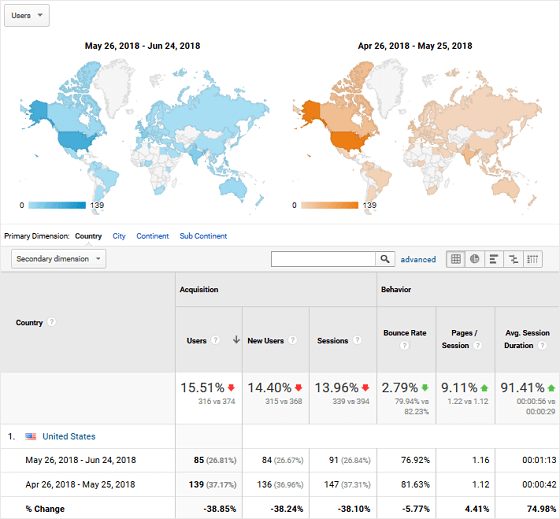 As you keep scrolling down the Overview Report page, you’ll see the Top 10 Countries where you’re your visitors are located. You can see where you get the most visits from and the actual number of visitors. If you want to see a detailed report, you can always click the View Full Report button at the bottom of each report. There is a View All Countries Report for this report. On clicking this button, it’ll redirect you to your Google Analytics account page. There, you’ll see a more detailed report. The last section of the Overview Report is Top Posts / Pages. You can view the most popular posts / pages on your site and the total number of visits they received from there. Next to the Overview Report tab, you’ll see the Publishers tab. 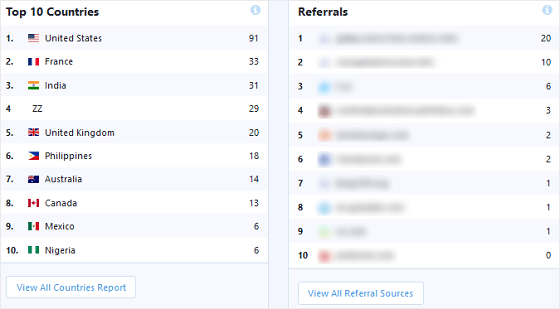 You can view some of the other key metrics for checking your site visitors’ number from there. Although all of these reports are useful for checking the number of visitors, demographics data is especially useful. This shows your site visitors in graphical charts by their age and by their gender. 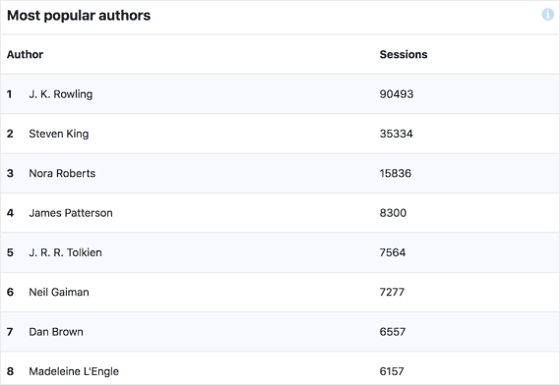 If you want to learn more, read our beginner’s guide to find demographic and interest reports in WordPress. You can see the number of visitors, pageviews, transactions, etc. for your shop pages from the eCommerce tab. MonsterInsights comes with a powerful eCommerce addon which simplifies and automates advanced eCommerce tracking in WordPress. 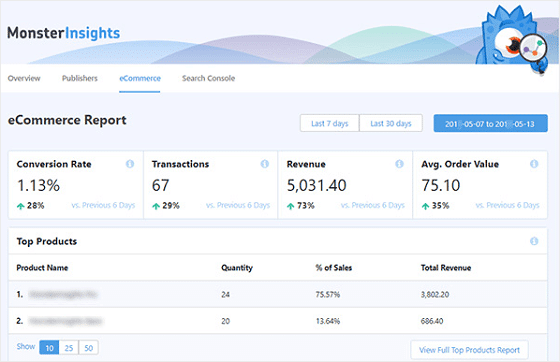 In the eCommerce report, you’ll see data such as your shop’s conversion rate, the number of transactions, how much revenue you’ve generated, and the average order value. You can also see a list of your eCommerce shop’s top products. That way you’ll know which products to continue promoting. The Search Console report shows you the top 50 Google search terms your site’s ranking for. From this report, you can view which keywords are driving you the most visitors. This helps you with keyword research and SEO. If you’re new to Search Console, here’s our step-by-step tutorial on how to configure and use Google Search Console. Using these metrics, you can get a clue as to what users find most interesting on your site. Then, you can analyze, and plan informed business strategies. If you want to learn more about this, you can check out our helpful guide on using custom dimensions. Contact forms are the main points of user interaction on your site. By tracking forms, you can see how many site visitors view and submit your forms. In order to track forms, you need to install the MonsterInsights Forms addon. It’s available only in the paid version of the plugin. 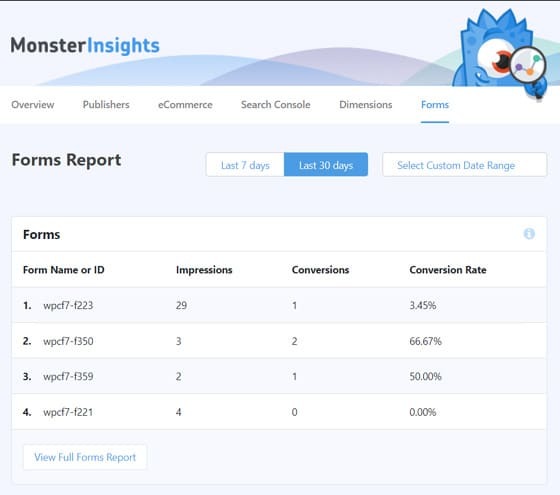 MonsterInsights supports all the major contact form plugins and provides you with a comprehensive report for your form conversions. We hope this guide helped you to learn how to check the number of visitors for your WordPress website. If you liked this article, you might want to check out our guide on how to drive traffic to your online store. And, don’t forget to follow us on Twitter and Facebook for more Google Analytics tutorials.